Whether you're an avid diver, newbie snorkeller, travelling with family, non-swimmer or planning a romantic reef escape; there's a whole spectrum of tours and activities that can provide you with an experience of a lifetime on the Great Barrier Reef. 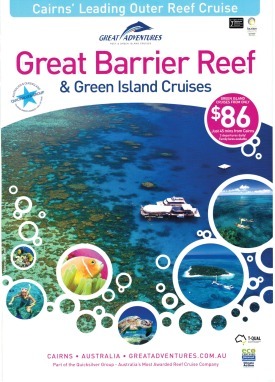 This cruise is ideal for beginners, experienced snorkellers & children of all ages. Enjoy a free guided snorkeling tour, live music & delicious Aussie BBQ lunch. Snorkel supervisors will provide a briefing so you know where to find all the 'cool stuff'. A selection of buoyancy aids (foam noodles, life jackets & wetsuits) and FREE snorkel guides are available all day long to guide you through the natural maze of beautiful coral and fishes. Departing from Port Douglas, Wavelength visits up to 3 amazing reef locations with sites selected based on the specific needs of snorkellers. This small group (max 46 people), low-impact, close to nature educational adventure offers a personalised experience with crew spending more time in the water to help you get going and to point things out. Reef Experience visits 2 beautiful coral reef locations departing from Cairns. If you're new to snorkelling or not so confident in the water, a friendly crew member will be your in-water guide, guaranteeing you a fun and safe way to see the Great Barrier Reef. All snorkelling equipment and wetsuit hire is included, along with free snorkelling instruction & guided snorkel tours for anyone who requires assistance. Calypso Pure Snorkel is a dedicated snorkelling vessel departing Port Douglas daily. With much of the reef’s colour and marine life visible within a couple of metres of the water’s surface, snorkelling offers all swimmers, regardless of their skill level, the opportunity to see this diverse eco-system up close. Wide stern decks and submersible platforms provide easy access for getting in and out of the water. 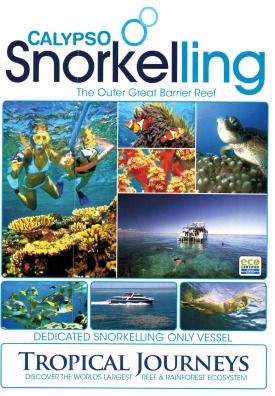 Enjoy a full day of unlimited snorkelling and/or the chance to complete up to 3 dives. SeaQuest has 17 exclusive moorings to choose from located at Norman, Saxon & Hastings reefs. Catering for introductory divers, certified divers & snorkellers. The Discover Scuba Diving program is a perfect for beginners. Your instructor will prepare you with the necessary skills, equipment & knowledge before your exciting first dive! Departing daily from Port Douglas, Silversonic offers access to 3 stunning & exclusive reef sites at the renowned Agincourt Ribbon Reefs. First time divers can take the plunge with an experienced dive instructor. 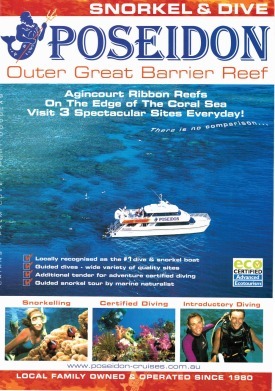 Certified divers can enjoy up to 3 guided dives. Unlimited adventure snorkelling & a bonus guided snorkel tour is also available. Silversonic has one of the few permits available allowing guests to swim with dwarf minke whales. Visit 3 different & spectacular reef sites at the Agincourt ribbon reefs with Poseidon. Highlights include drift & wall dives, isolated pinnacles and coral gardens with their endless variety of colourful marinelife. Certified and introductory divers can enjoy up to 3 dives. 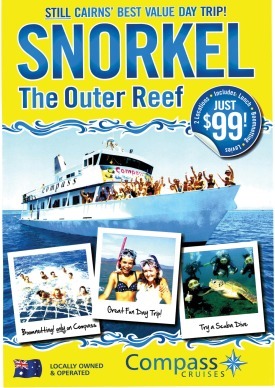 Unlimited snorkelling is available for non divers. Poseidon also holds a special permit to swim with Dwarf Minke Whales between the months of May and August. Departing daily from Cairns, Silverswift offers an active day visiting 3 different outer reef locations at Flynn, Pellowe, Milln and/or Thetford Reefs. First time divers can complete up to 2 dives in complete confidence with an experienced dive instructor. Certified divers can enjoy up to 3 dives which are all guided to maximise your experience. 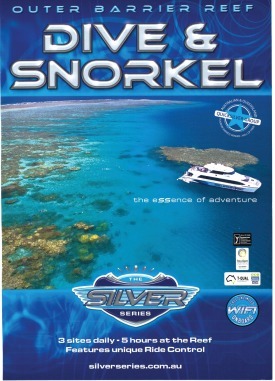 A guided snorkel tour is also provided for non-divers. 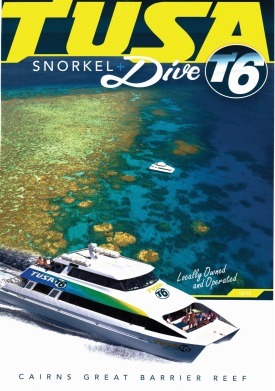 Locally owned and operated, Tusa Dive has been taking divers and snorkellers to the reef since 1986. Their latest vessel, Tusa T6, is currently Cairns' newest reef vessel, custom designed for cruising the Great Barrier Reef cruising. Each day Tusa visits 2 unique reef locations from a choice of 16 spectacular dive and snorkel sites. 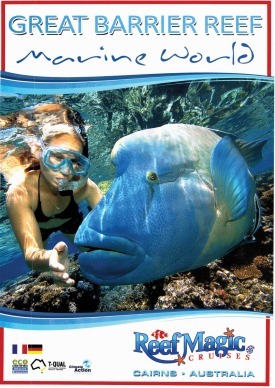 Marine World caters for all activity levels & swimming abilities. Offering 5 hours of fun, there is plenty of time to do it all! Snorkel in the sheltered coral lagoon, go scuba diving, join a Marine Biologist on a Guided Snorkel safari, view the reef on a semi-submersible tour, glass bottom boat tour or in the underwater observatory. Try a Helmet Dive without getting your hair wet, or view the reef from above on a scenic helicopter flight. Departing from Port Douglas, Quicksilvers' floating pontoon is the biggest & most spacious platform on the Great Barrier Reef. Enjoy the comfort of undercover dining, showers, change rooms, sun deck, snorkel platform, underwater observatory, dive area & semi-submersible tours. Guests confined to a wheelchair are also catered for with a specially designed water powered lift that allows for easy access into the snorkel pool. 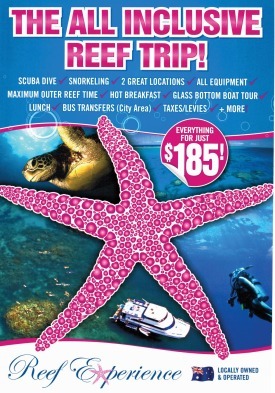 Great Adventures spacious platform offers everything you need to make your day at the reef as comfortable as possible. With undercover seating, full bar facilities, change rooms, freshwater showers, sundeck, & scuba diving facilities with a semi-submerged platform. Activities cater for people of all ages, perfect for swimmers & non-swimmers. This is the latest Outer Reef departure from Cairns at 10:30am. 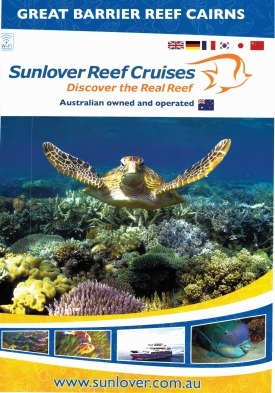 Enjoy up to 4 hours at the reef with Sunlover Cruises. This trip catering for all abilities. Complimentary activities include snorkelling, glass bottom boat and semi-submersible coral reef viewing tours, an underwater observatory, marine life touch tank, and a sumptuous seafood buffet lunch. There are also a variety of optional extras available including scuba diving, guided snorkelling safari and Seawalker Helmet Diving. Passions is a 25 metre high-performance catamaran that has earned many awards including the Australian Tourism Award for Adventure. Visiting 2 unique locations daily - Michaelmas Cay and exclusive Paradise Reef. Michaelmas Cay is great for young families or inexperienced snorkelers. Join a glass bottom boat tour. Certified scuba divers will enjoy an amazing selection of dives including drift, wall & swim throughs. Ocean Spirit is a 32 metre luxury catamaran that sails daily to Michaelmas Cay. This 1.5 hectare vegetate coral cay is home to an abundance of life, from seabirds, to turtles and hundreds of species of reef fish. This relaxed trip is ideal for swimmers & non-swimmers. Scuba dive, snorkel or stay dry on a Semi-Submersible tour. This trip includes a complimentary glass of sparkling wine, cheese & crackers on the homeward journey. Avoid the crowds on this personalised sailing tour. With a maximum of 20 passengers, you will visit the beautiful Upolu Reef, where there is plenty of time to snorkel, scuba dive or simply relax in the bow nets on the boat. Being owner operated, Reef Daytripper takes a personal interest in the well being of customers & their awesome crew are considered a part of the family delivering enthusiastic, friendly hospitality to all guests. Ocean Free is a beautiful 63ft schooner, which sails daily to tropical Green Island. Escape the crowds on this personalised reef, sail and island experience (max 25 guests). Exclusive Pinnacle Reef is located just 1km offshore from Green Island, where you will have the opportunity to enjoy a swim, snorkel, scuba dive or just relax. You will also have flexible time to explore Green Island, before hoisting the sails back to Cairns. Sailaway is a luxury sailing catamaran (maximum 33 guests) departing from Port Douglas to the Low Isles. The Low Isles is a protected Coral Cay surrounded by magnificent coral gardens. Enjoy 5 hours to relax on the island, join a guided snorkel tour in the sheltered lagoon, take a glass bottom boat tour or laze on deck before an exhilarating sail back to Port. Green Island is a beautiful coral cay located 27 km offshore from Cairns. Full & half day cruises are very popular and ideal if you're short of time, have a young family, or want a reef & island experience. Activities include snorkelling, glass bottom boat tours, semi submersible tours, rainforest eco walk, scuba diving, sea walker, heli scenic flights and plenty more! Fitzroy Island is located a 45 minute ferry ride from Cairns, offering an island nature experience. This is an ideal day trip for families, couples, nature lovers and those with a sense of adventure. Swim, snorkel, dive, eat, play, relax, walk. There is something for everyone. 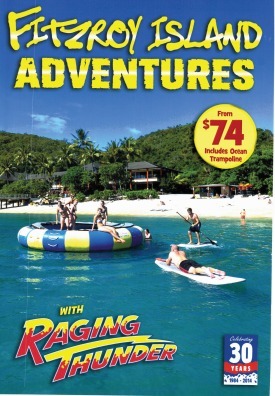 Raging Thunder and Fitzroy Fast Cat offer daily departures from Cairns. Michaelmas Cay is a small, vegetated sand cay surrounded by a spectacular fringing reef. This National Park is a protected sanctuary for migratory seabirds, home to at least 23 species. The surrounding reef features a rich array of marine fauna, including giant clams. Turtles are commonly sighted in the sheltered lagoon. Both Ocean Spirit and Passions of Paradise visit Michaelmas Cay on a daily basis. The Low Isles is a stunning 4 acre coral cay surrounded by 55 acres of reef. The corals are very close to the island, which makes snorkelling easy for beginners and children. Reef activities include guided beach walks, snorkel tours, turtle spotting and glass bottom boat coral viewing tours. Quicksilver's Wavedancer and Sailaway both visit the Low Isles daily, departing from Port Douglas. Frankland Islands Cruises is the only commercial operator allowed to visit the totally uninhabited Frankland Islands. Located 10 km offshore from the mouth of the Russell & Mulgrave rivers, this trip offers a great value river, reef & island experience. Enjoy a 30min Mulgrave river cruise before a short open water crossing. Once on the island you can snorkel straight off the beach and explore the island at your leisure. Compass Cruises offers a great day for travellers on a budget, and is very popular with backpackers. Visiting 2 different locations - Hastings reef & Breaking Patches near Michaelmas Reef. Included in the day is unlimited snorkelling, a delicious lunch, wine, cheese & biscuits on way home & the famous Compass Boomnet! It's not the fastest boat on the reef, but the enthusiastic crew certainly make a great entertaining day! Fitzroy Island is only a 45 minute cruise from Cairns. All transfers with Raging Thunder include free use of the Ocean Trampoline! Bring your own picnic and explore the island. There are hiking trails and guided walks as well as numerous water sports options available. The Beach Hire Shack offers kayak and snorkel hire, as well as glass bottom boat tours that can be organised on the day. Green Island features a unique reef and rainforest environment, providing an ultimate one-stop tropical experience. Great Adventures offers the choice of 3 daily departures to Green Island. Half and full day options are available, with a range of exciting optional activities, you can design your day at your own pace. Reef Sprinter offers 2 half day reef options from Port Douglas. 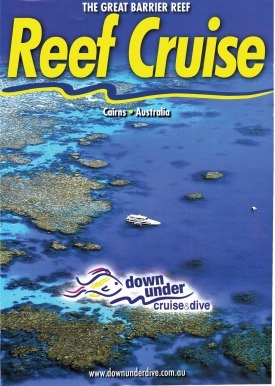 Choose from a Low Isles reef tour or a half day outer reef tour. Travelling at an amazing 80kph, Reef Sprinter can get you to the Low Isles in just 15 minutes or Outer Reef in just 40 minutes (sea sick free!). Travelling at 40 knots (80km/hr) means getting there is half the fun! This trip offers a personalised service with a maximum of just 14 passengers. Departing Cairns at 7:30am, the 1200hp (4 x 300hp) vessel "That's Awesome" will ensure you are the first to arrive at Green Island. This is the best time for viewing marinelife before the crowds arrive. Enjoy free time to snorkel, explore the island or just hang out. You will arrive at Green island before any other vessels, and spend about 3 1/2 hours there and still get home in time for lunch. 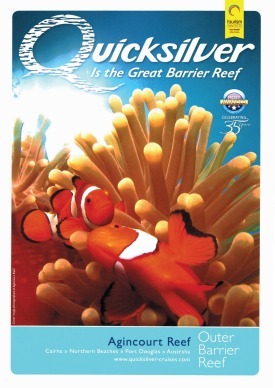 What better way to impress your friends than to fly out to Quicksilvers' Outer Barrier Reef Platform & back again in comfort & style. 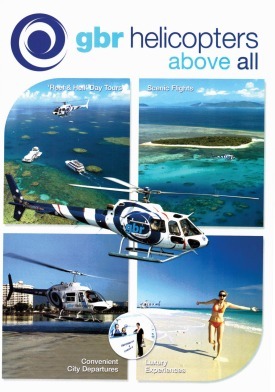 Quicksilver Helicopters pilots will explain the miracles of the Great Barrier Reef on the way. Quicksilvers platform has facilities for both swimmers & non-swimmers. Explore the reef snorkelling, from a semi submersible, or from the underwater observatory and enjoy a hot & cold tropical buffet lunch. Add a touch of class to your Reef Experience and upgrade to the Top Deck Club. The Top Deck Club package comes with loads of added benefits including a personal valet for the day, personal dive/snorkel guide, VIP seating in the Captains wheelhouse, a deluxe lunch and Australian wine on the return journey. Enjoy a full 6 hours at two different outer Reef locations in luxury and style. Ocean Freedom offers a personalised snorkelling, diving & glass bottom boat experience. The 5 star luxury cruiser visits 2 great destinations including the crystal clear waters of Upolu Cay and "Wonder Wall" on the outer edge of Upolu Reef. What makes this trip stand out is the attention to care especially for first time snorkellers. The scrumptious seafood smorgasbord lunch including smoked salmon and prawns is also a winner! Ocean Spirit is a 32m luxury sailing catamaran providing a smooth sailing experience. Enjoy the spacious indoor cabin, or relax on the foredeck & soak up the Queensland sun. Sailing daily to Michaelmas Cay, you can choose from a wide range of activities. A delicious hot & cold buffet lunch including fresh prawns is included, as well as a glass of sparkling wine served on the homeward journey with cheese and crackers. For the ultimate romantic reef experience why not spoil yourself & loved one with an escape to your very own desert island. Travel in style with a breathtaking scenic heli flight over the Great Barrier Reef, before arriving on a pristine Coral Sand Cay. Here you can relax in solitude, swim, snorkel, soak up the remoteness of your own private sand cay and indulge with a gourmet meal of tropical platters & premium beverages. Fabulous for families!! Children up to 16 years are charged at childrens rates on this tour. Visit 3 sites in 1 day departing Cairns on Silverswift & Port Douglas on Silversonic. Enjoy a sleep in with this 10:30am departure from Cairns.